Police arrest 35-year-old suspected of stealing, burning Torah scroll in Israeli coastal city of Hadera. Israeli police have arrested the suspected vandal believed to be responsible for the theft and destruction of a Torah scroll in the coastal city of Hadera. 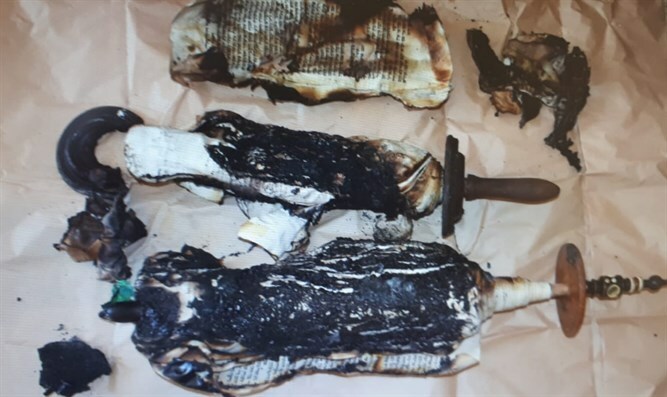 A police spokesperson announced Monday morning that officers had arrested a 35-year-old Hadera resident who is suspected of removing the sacred texts from the Great Synagogue of Hadera on Hagiborim Street and setting them on fire. On Sunday, synagogue officials discovered the remains of the Torah scroll in a garbage can outside of the synagogue, after worshippers complained of smoke entering the house of worship. The Torah scroll was found burning in the garbage can – apparently thrown there by the suspect shortly after the set them on fire. Synagogue officials reported the incident to local police on Sunday. Sunday evening, officials at the Great Synagogue of Hadera said the vandal had discovered where the keys for one of the storage arks for out-of-use scrolls were located, and used them to remove the scroll. Investigators said the suspect lives near the Great Synagogue. “Police units arrested a suspect who set fire to Torah scroll in a synagogue in the city of Hadera,” a statement issued by police Monday read.